I had never considered buying gardening trousers. Because I work from home, I garden in short snatches and stolen moments. I didn’t think it would be worth changing trousers just to spend fifteen minutes weeding. Gardening trousers – surely – are for people who spend hours gardening? Or professional gardeners? So when I was given a pair of gardening trousers for review by Genus, I was somewhat wary. It’s difficult to know whether something is worth reviewing until you’ve tried it. And I wouldn’t want to write about any product unless I have tried it and think it’s good. Of course, even then, it’s only my opinion – but at least it’s based on using the product regularly in a middle-sized garden. So while I never guarantee a review, I try not to accept anything unless I feel reasonably sure it will be something worth recommending. I keep my Genus gardening trousers hung up by the back door for a quick change. But that can be a Catch-22. I could find myself just reviewing things I broadly know about already. You have to take a leap of faith occasionally. Otherwise I’d never try anything new. Disclosure: I have bought some of the following, others were presents from friends or family and others sent to me for review. I’ll say which is which. Also links to Amazon are affiliate links, which means I may get a small fee if you buy through them, but it doesn’t affect the price you pay. Other links are not affiliate. I wouldn’t be without them now. Genus Gardening trousers are stretchy, water-resistant and comfortable. They have big pockets with strong linings that you can put tools in, including a stab-resistant pocket for sharp tools. And there is a zip pocket at the back for your mobile phone. When I used put my phone in my jeans pocket, it often fell out while I was working. Or I bent over to weed, which squeezed the phone, activating the voice function. It used to give me quite a fright when my pocket started shouting ‘I’m sorry, I didn’t understand that command’ at me. Although having your phone zipped behind you is a little fiddly, you can be confident that you’re not sending pocket calls or otherwise activating your phone in any way. But the biggest bonus – and a great time-saver – is that Genus trousers have padded knees. If you are going to pick up your tools, then – in theory – it should be just as easy to pick up your kneeler. But somehow it doesn’t work that way in this house. I used to spend ages fiddling about. First, I’d look for my kneeler or knee pads. Then I’d find I’d left it outside where it had been rained on. After which I still had to find my tools, by which time I’d put down the kneeler again. 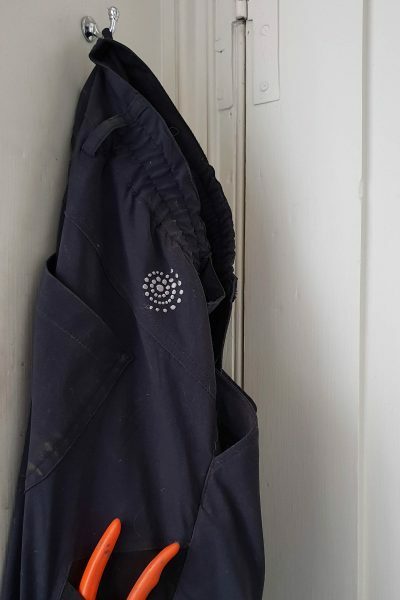 The kneeler would be soggy when I knelt on it, so I’d have to change my trousers anyway…..
Now I keep the gardening trousers hanging up by the back door, along with my secateurs and a scraping knife. I can go straight out into the garden, do fifteen minutes weeding, then back in for a quick trouser change again. It really is all so much easier. Genus Gardening trousers start at £95, which is more than I usually pay for any trousers. But they are made of strong, long-lasting material and will save wear on your ordinary clothes. I use a Wolf Garten Scraper for most weeding. It looks like a right-angled knife, and is sold for scraping moss or weeding between paving stones. However, I noticed a gardening friend using it for all sorts of weeding. It makes an excellent all purpose tool, and I think I’ve probably used it more than any other single tool since buying it in June 2016. I often place it parellel to the ground, just an inch or so under the soil, to rake away weed roots. 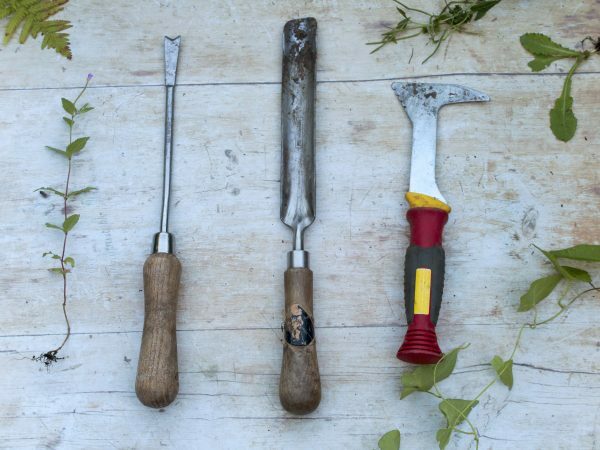 All three of these weeding tools are useful, but the one I use the most is on the Wolf Garten scraping knife on the right. I think most amateur and professional gardeners have their favourite knife-type tool, and this is mine. 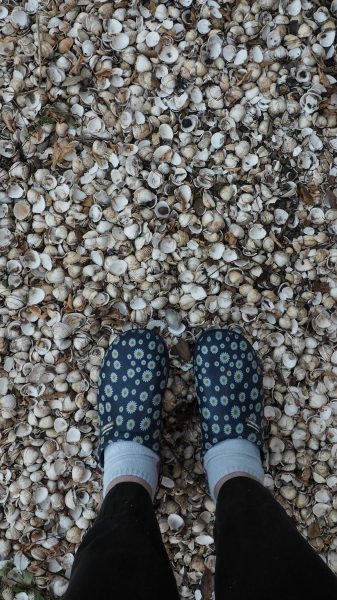 Gardening clogs have been another revelation. I was sent a pair of ‘Eva’ ‘Daisy’ cloggies by Town & Country. They’re so light that I couldn’t believe the package contained shoes. Cloggies are so easy to slip on and off. I’m always going in and out of the garden, often with my hands full, so these have made my life much easier. And I do actually garden in them. My gardening isn’t particularly fierce – the Middlesized Garden is approximately 100ft x 80ft of relatively decorous walled town garden. So with the Genus gardening trousers and the Eva cloggies I have enough protection from the elements. Eva Cloggies in ‘Daisy’ from Town and Country. So easy to slip and off if your gardening – like mine – is done in short bursts when you have a few moments. You can also get Eva cloggies from Amazon. Gardening gloves are a repeat buy. However good they are, they get lost or are worn through. I swear by Showa, which I buy cheaply from Amazon. A number of fellow gardeners on Twitter also seem to like them. I was also given a pair of Fiskars gloves to review, and I’ve worn them regularly for over a year. They’re good. Mr Middlesize likes a tough glove and is devoted to his Cobra gloves for heavy duty tasks. I can’t remember how we acquired them, but we’d happily buy another a pair if these got lost. Our favourite gloves: Fiskars, Showa (mine) and Cobra (Mr Middlesize). Never buy gardening gloves without trying them on (until you find a brand you love). You need flexibility and strength. Too many mass-market gardening gloves are pretty, but stiff and unyielding. 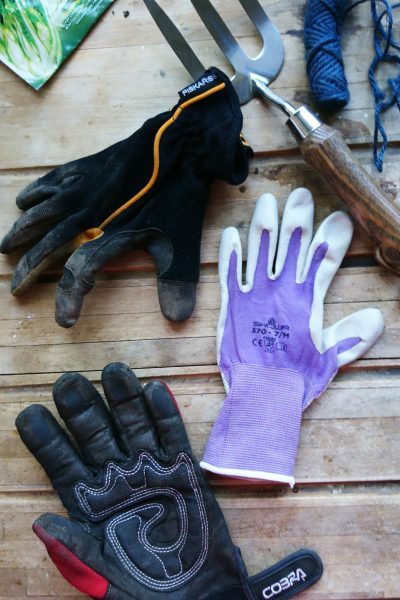 Here’s a post with more advice on buying gardening gloves. I have a galvanised metal wheelbarrow, but can’t remember where it came from. I’d never really thought about it. But one day we had a ton of compost delivered. A rather testy Mr Middlesize wheel-barrowed it from the front garden to the back. He then informed me that a wheelbarrow that is comfortable for someone of 5’5″ (me) is a back-breaker for someone of 6’4″(him). We researched wheelbarrows, looking for a large, lightweight and strong wheelbarrow at a good price. Our final choice was a lightweight 120 litre green wheelbarrow with a Fatboy wheel from Wheelbarrows Direct, which he has found excellent. So we are now a two wheelbarrow family. If you don’t have anywhere out of sight to store wheelbarrows, it may be better to buy the wheelbarrow for the taller person. I find his wheelbarrow just as light and manoevreable as mine. But bear in mind that a big wheelbarrow will be heavier than a small one if you fill it right up. Once again, it’s probably a good idea to try out a wheelbarrow before buying it. My wheelbarrow on the left and his on the right. 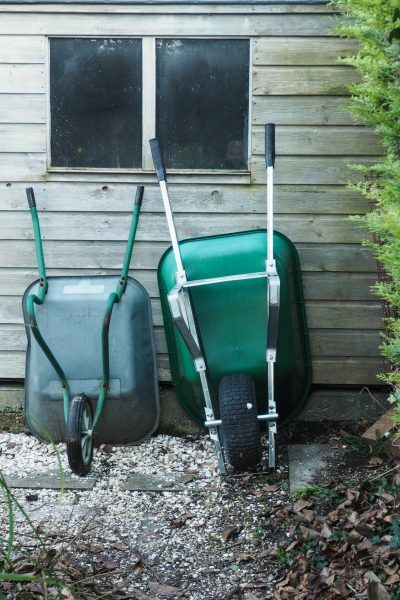 So what are your essential pieces of gardening kit? Different brands probably suit different people so if you’ve had a particularly good experience with a brand, let me know in the comments below. After doing a tour of our garden every month for a whole year on the Middlesized Garden YouTube channel, I noticed that some plants contributed again and again. I’ve called them my ‘plant heroes’, although fashion-forward gardening experts may find them quite dull and pedestrian! Let me know what you think, as I have championed what is probably Britain’s least popular plant. 10 comments on "Brilliant gardening trousers and other useful kit"
This is a really handy guide to gardening kit! Perfect timing too what with the last of the January sales going on at the moment. Those gardening trousers look brilliant, in particular. It seems like they could make life a whole lot easier and help encourage us to get out in the garden no matter what the weather! We too are a two wheelbarrow family, I wouldn’t have it any other way. 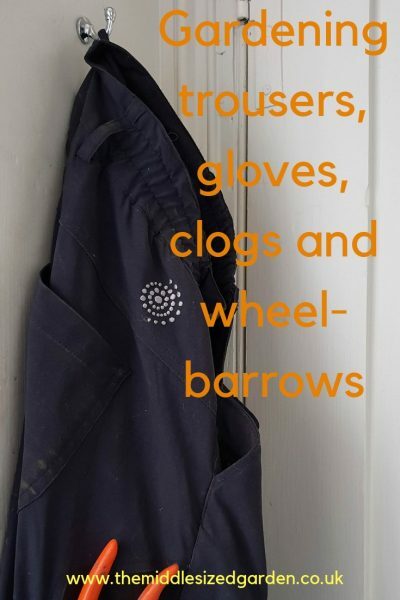 I’m intrigued by the gardening pants, I’ve been mulling over a pair of gardening overalls (here in the US, they are from Duluth Trading Company) for the same reasons so I might give them a try after hearing how much you like your dedicated pants! Thanks for the review! I hope you find them satisfactory. Thank you for commenting. I can vouch for Genus trousers being fantastic. I wouldn’t be without them. They’re warm and comfortable, wash easily and dry very fast. I also have their thinner summer ones which are great too. Thank you for the reviews, the trousers look interesting. I am always ruining jeans with mud that never seems to come out properly! Me, too. Mud is quite extraordinarily difficult to wash out. just wanted to say that i very much enjoy your informative and entertaining posts. my garden is probably quite similar is size and setting to yours so your tips are generally very useful. keep up the good work!